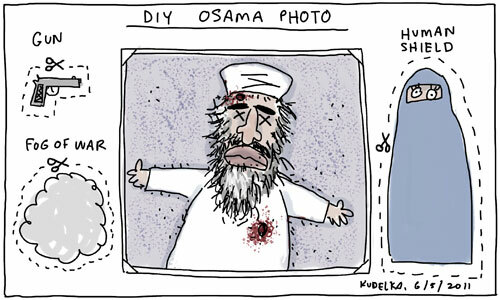 The White House has decided not to release photos of the body of bin Laden on the grounds that it would be provocative, though some might say that in the provocation stakes the horse has already bolted, been shot by Navy SEALs and buried at sea in the traditional Muslim fashion. Let’s face it, if you weren’t inclined to believe bin Laden is dead without photographic proof, you probably weren’t going to believe the photos haven’t paid a visit to Dr Photoshop anyway. If you do want something to stick on your fridge next to your picture of Wills and Kate having a royal snog, feel free to cut and paste whichever version of events you’re most comfortable with, especially if you need to discreetly cover up the gory bits. Have fun, and be careful with the scissors. So far, no one else has made me chuckle at this(latest) debacle. Thanks. I don’t know. The one doing the rounds on Facebook about the girl marries the prince and the bad guy dies aka this weekend has been brought to you by Disney made me smirk a little.